I believe that the beauty of the line is of vital importance for calligraphy. As the calligraphy (“書”) with the history more than three thousand and several hundred years have produced so many kinds of calligraphic works, calligraphy learners have an abundance of copies of the works to study. Particularly, the letters inscribed on bones and tortoise carapaces, the letters engraved on a face of cliff or stones, the letters inscribed on a small wooden or bamboo plate with India ink, those letters are creating their own peculiar tastes of line. I am so much attracted to those kinds. I am also attracted to sharp and thin lines which are peculiar to the calligraphies written by “Kana” (Japanese syllabary) . In either case, since practice is done by using paper and brush, I keep writing until the ideal line is obtained with the help of a sense of touch when all of “brush”, “paper” and “ink” work in perfect harmony with me. It is difficult to explain the quality of the lines. The expressions such as clearness, lucidity, gracefulness are often used to explain it, however, proper discipline is necessary for both appreciators and writers while not yielding to vulgarity. What do I suppose to write when I create a work of calligraphy? To write characters is supposed to be intended essentially for expressing one’s thoughts, and I believe that the calligraphy is aiming at expressing them by writing lines with one’s personal tastes. Therefore, naturally we write by our own words. I write short poems when I try to value the meaning of what I want to say. There are some short poems also in this exhibition. 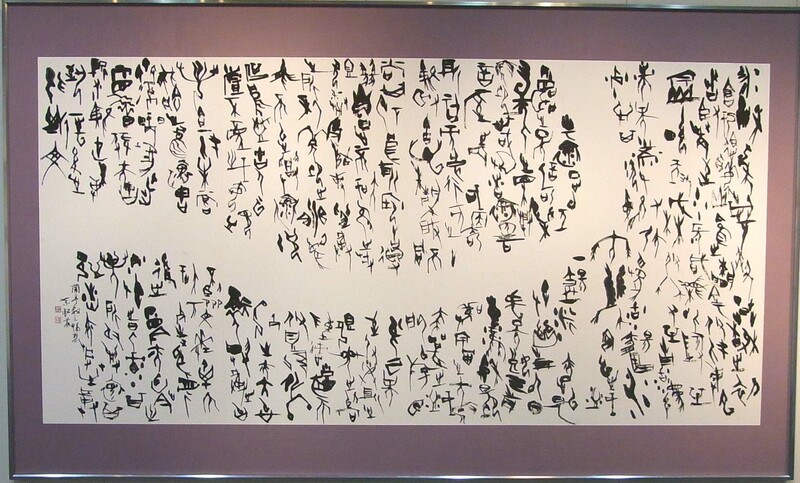 Besides my own poems, I calligraph the poems of Kawahigashi Hekigotou, a poet whom I respect. The following his works were used in this exhibition. When I refer to “own words”, I am not too anxious about the meaning of sentence. In other words, I believe that it also can be “own words” to visually express one’s own thoughts in the form of characters.